Want to develop a hotel management system ms access database project? Or need ms access project help from me? If yes then you are at right place. I am here to help you in ms access database projects. Management systems word is quite common nowadays and every knows how it works and what is the purpose of developing these types of software or web application. Without these types of software, we can not imagine our system to run successfully because storing database in a file with the help of pen is a very old thing. That’s, why there are so many systems available in the market which can be buy or person, have the option to develop a customised software/web application according to their requirements. Need ms access project help, ms access assignment help, ms access homework help or best ms access project ideas or database project ideas? Please fill the contact form and get instant help from me. This post is regarding Hotel Management System ms access database project, after reading this post you will get a lot of idea regarding ms access database and you can create ms access database project easily if you will give some effort. I have attached the complete screenshots of hotel management system ms access database project, here in this project I have implemented all possible operations and modules which must have to be in management system project. Here you can see, how I performed relational database operations to connect tables logically, and a beautiful and fully professional UI is there. If we are going through the only sentence that is Hotel Management System, everything looks clear means a system which manages all the things in the hotel. Now my topic is Hotel management system database project so now it is more clear that here I am talking about managing the database of a hotel. It can be customer record, employee record, manager record, customer history, customer booking and so many things which are related to the database. Database management system means managing data with computer software and interaction with users, systems, and database to analyze the data. This is a very broad field and any organization will be incomplete without these types of system. Hotel management System database project will also be having a lot of functions to manage the data and I am going to explain all important scenario regarding Hotel Management System ms access database project. What the important things created in the ms access database project. In this table, you can see all checkout and check-in details of the customer with their particular id’s that is check-in and checkout id with a number of days stayed by in the hotel. In customer record table, the first column comes with the customer id that is unique id, by making these types of id’s recognizing customer becomes very easy like just enter the customer id and you will get all the history of the customer. In this table, you can add all the details of the customer like Name, gender, contact number, address and other important information. Room Record table will store the record of rooms like room Id, Room No., the category of the room that can be Deluxe/Normal or any other category which you can add, you can add price and description of the rooms, like if the room is Deluxe then which type of facility you are giving. In switchboard table you can add a list of all the details in the table like Main SwitchBoard, Customer List, Room Availability, Check In/Check Out, Password Change potion with their proper arguments. Users table is defining the category of users and their types with their proper authentication password. here You can list the name of the users with their password so they can access the system according to their authority. For example, you see the below table where user Andrew has the username Andrew and his type is an admin so this category belongs to admin and he had a password by which he can access the system. Note- Dividing the users of any system is the very-2 important task because of the system is depends on the users so which user have which type of authority, its matter so much for the system. Now the table part is completed and I had shown all the possible table which I added in Hotel Management System Database Project Using ms access. You can add more tables here according to your need, like if you creating any big database so you need to add more tables here. One important thing I want to say here, creating tables in any database is not a hard task because you just have to create the columns and fill the values, but the task becomes hard while managing the table, making joins between the tables creating keys and relationships between the tables. So try to store the data in an easy manner so accessing data will be also easy and you can make database very simple. Now I am coming in the next part of this ms access database project that queries part. Here I will show my added queries in this project but before entering in this part firstly we have to know what is a query? I know all of you know aware about the query and if you are going to work with the database then you must know about the queries because without the queries we can not imagine a database system or any kind of database management system project. What is a query in a database? Queries are a type of mechanism which is used to retrieve the information from any database system. This is a SQL database query. Working with queries in ms access is easier if we compare it with other database technologies. 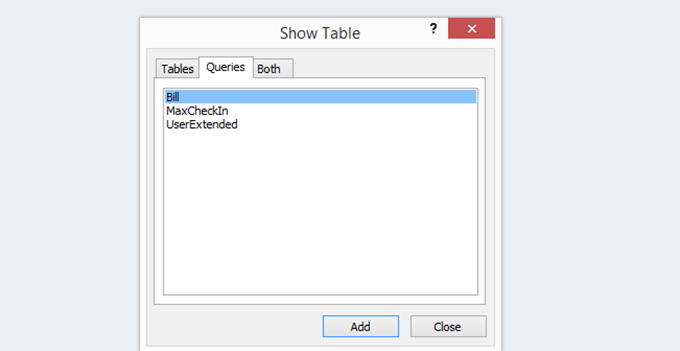 To set queries in ms access database you just have to click in the particular table and then go on the menu and you will see the create option click there, after clicking there you will get many options, for creating the queries in ms access just click on query design option from there you can set queries easily according to your requirements. Here I had added three queries first one is for Bill second one is for MaxCheckIn and last one is for UserExtended. Now we completed with the query part of this project and coming with the very important portion of the ms access database project, that is form creation part. I had added so many forms here and tried my best to give the attractive look to them because GUI should be attractive and it gives the best experience to the user to use the application. So before creating the forms, you just have to do some very basic research like GUI should be related to your project title and it should have to give the feel of the project. The color combination and image formation should be taken care of while creating the forms because of its matter a lot. By choosing a good color and image formation you can make your form more and more attractive. This is the main switchboard of the system, from this screen we can enter in the system to complete our task. Other options are also there you can see for logout and for selecting users while clicking in the users you will see a list of user with their proper username and type of user. This is the screenshot of login form which I created, from this board a user can enter their particular username and password to enter in the system. 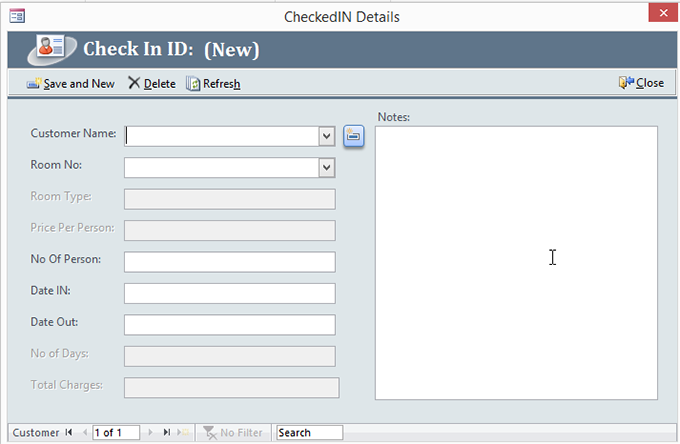 When a user enters the username and password it will check the values in the table and after authentication, it will allow the user to enter in the system or in the database. You can create your own login form and make it more attractive. 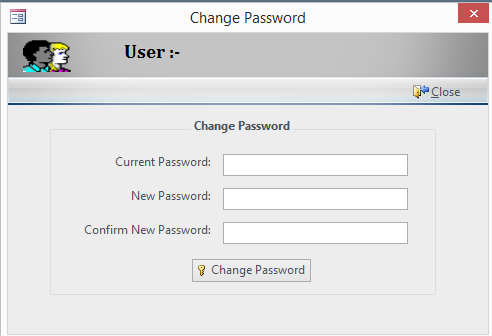 This screen will allow the user to change their password if they want, for doing this they just have to enter their current password, then new password after that they have to confirm their new password while doing this password will be updated in the database a user can login with their new password. This is not a very complex task, it can be completed very easily. You can put some more conditions for changing the password but be sure long form makes system complex. This screen will store the customer details like their name, gender, mobile number and all the personal information of a customer. 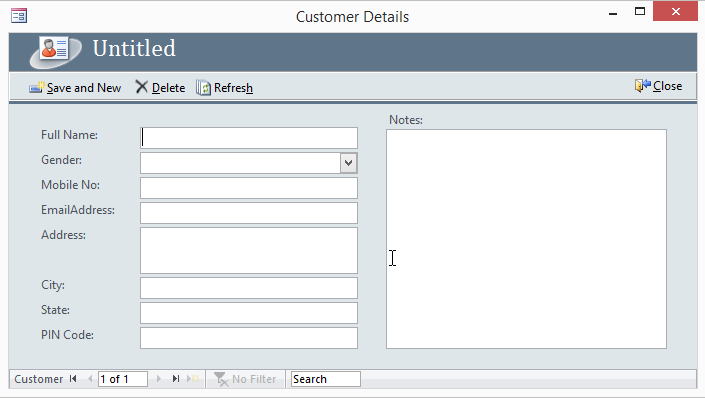 Here you can see a button save and exit, from this button you can save the entered record in customer record table. Here you can also see the option of notes where you can write any extra thing regarding the customer or any special notes you want to add here. This form is for customer check-in details, whenever a new customer will arrive at the hotel, creating check-in id is very essential. Here you can give the option to select the name of the customer and choose room number which you want to allow to the particular customer after that system will showroom information like type of the room and price of the room. Now you have to enter a number of people who are going to stay in the room, date of check-in and date of checkout. Once you review the form there is a button named bill, while clicking on that you can see the final bill. It will show the summary of room history with all the required details and total stay charges along with tax and other details which you want to add. 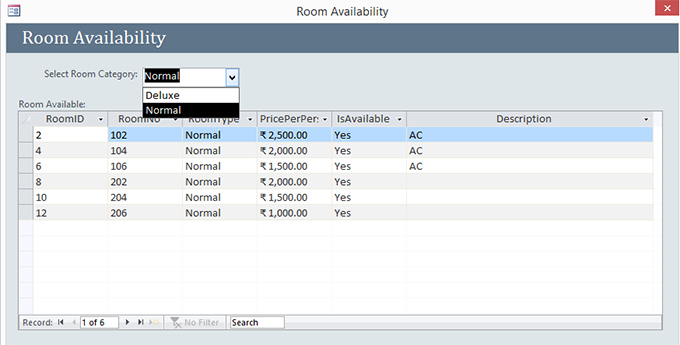 This screen is for checking the room availability, from here you select the room type after that you will see the particular room is available or not with the price of the room. While making this form you can add a description about the room, so it will be easy to check the specification about the room and explaining it to the customer will become very easy. This screen will allow creating a new user, from here you can create an admin or a new user with entering the details of the user, i.e. first name, last name, username, password and also the category of the user. From here you can define a user is a normal user or an admin. After that click on save and new button so the record will be saved in the database and new user will be created. I am not sharing all screenshots of this ms access project because there is a very long list of it. If you want any type of help in ms access project or any other database project, I am excited to help you, just fill this contact form I will contact you within few minutes.